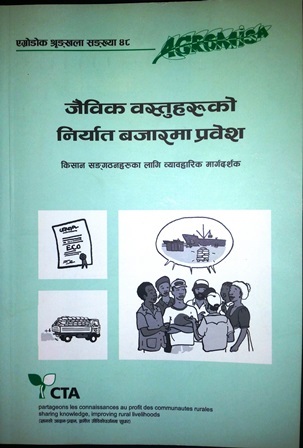 Agromisa has many handbooks designed to support the farming practices of small-scale farmers. It also has handbooks that deal with more commercial and marketing aspects. One of these attracted the attention of a tea growers’ federation in Nepal: Entering the organic market. This Agrodok 48 describes how the organic market operates and how producers can access it. In Nepal members of the Nepalese Central Tea Cooperative Federation were interested in marketing their product through organic channels. It came to their attention that Agromisa has produced a handbook that detailed the way in which this market works and how it can be accessed. For the Federation it was a short step to translating Entering the organic market into Nepalese and circulating it amongst its 200 members. Now they are in the processes of exploring potential markets. For more information please contact Agromisa (agromisa@wur.nl). This entry was posted in News and tagged Nepalese, Organic farming, Organic market, जैविक बजार.